This is a workshop for anyone who wants to learn about the preparation, planting and maintenance of areas to be revegetated. It is held at Ian Freeman's property where hole digging and planting can be demonstrated. Mark McCaffrey and Peter Snodgrass will talk about the preparation and maintenance of sites, and Ian Freeman will talk about planting the trees. TREAT will provide a morning tea after the talks (at Ian's shed) and then we will walk to an area where hole digging and planting will be demonstrated. Please register with Barbara Lanskey (ph 4091 4468) if you wish to attend. Ian's property is near Lake Eacham on Cutler Road off Lake Barrine Road. This workshop is being organised by Sustainable Solutions Global (SSG) and will be about ways to protect a property's conservation values for future generations. Talks by local experts will focus on Nature Refuges and other conservation protection mechanisms, weed control and property mapping. Please let SSG know (ph 4096 8026) if you wish to attend. Lindsay Road is off Glen Allyn Road at Malanda. This annual workshop demonstrates how to identify trees from leaves and how to sow different types of seed. It is held in two sessions separated by a morning tea provided by TREAT. Alan Gillanders (with help from wife Maria) will demonstrate the different leaf characteristics of trees. Peter Snodgrass from QPWS will show the different seed types and explain how to germinate and grow them. Please register with either Barbara Lanskey (ph 4091 4468) or the QPWS nursery (ph 4095 3406) if you wish to attend. Places are limited to about 20. The workshop is scheduled to finish at 12.30 pm. The Annual General Meeting on 4th September was well attended. After reports from the Nursery Manager, Treasurer and President, the management committee was re-elected. The management committee for the next year is: President - Angela McCaffrey; Vice-president - Ken Schaffer; Secretary - Doug Burchill; Treasurer - Mandy Bormolini; Committee members - Barbara Lanskey, Simon Burchill, Alan Gillanders, Ian Freeman, Beth Smyth, Dave Skelton, Alison Eaton, Michael Cole-King. Jenny Maclean was our guest speaker and gave a very interesting presentation about bats. I was particularly impressed that researchers are now trying to learn from the extraordinary immune system and longevity of bats. This might give the bats some much-needed positive press. TREAT has had another highly successful year with much work done at the nursery, plantings, field days and workshops. Plenty of promotional work has been done through newsletters, the website, newspaper articles (thanks to Geoff Errey) and the Small Farms Field Day stall. Despite this our membership has remained steady at around 400 households which is substantially lower than a few years ago, so even more work needs to be done to get our message out to the local community. Thank you to Biotropica for their continued sponsorship of our newsletter. Looking in detail at each aspect of TREAT, I start with Friday mornings at the nursery. Many volunteers continue to turn up weekly to sow seed, pot up seedlings, weed, clean pots and generally get on with the task of raising the many thousands of trees produced each year. Volunteer numbers are swelled by School for Field Studies students during their terms and I am constantly amazed by the number of people turning up. Thank you to all involved including those looking after morning tea. Thanks also to QPWS staff, Nick Stevens, Peter Snodgrass, Darren Caulfield and Simon Brown who has temporarily replaced Darren since January. They do an amazing job running everything for the rest of the week and collecting all the seed. Due to poor climatic conditions over the last two years, seed has been in short supply for several species, so potting has been substantially down in the last 12 months but this has been made up for by the amount of time weeding and consolidating trays in the bays. The nursery has continued its big make over this year as a result of last year's Friends of Parks funding and FRRR (Foundation for Regional and Rural Renewal) providing new bench supports and racks raising the outside benches to a more comfortable height and allowing better air circulation. Nursery hygiene has been particularly good this year and so the place looks a picture. The nursery is complemented by TREAT's Rainforest Display Centre open Mondays, Wednesdays and Fridays and I thank all the volunteers involved but especially Bob Morrison and Jadwiga Czyz for their regular commitment over the past year. Nine plantings took place this year with three being TREAT's Peterson Creek project plantings where over 2,700 trees were planted at Ian Freeman's property and 1,400 were planted at Peeramon Bridge, partly on Kevin and Isobel Mather's property and partly on the road reserve. Ian's planting posed particular challenges this year with over 1,200 being planted in the swampy ground of the flood plain. Dead grasses formed a thick mass which had to be brush-cut to reach the ground for hole-digging. Species selection was reduced to about 20 known swamp survivors but even then some didn't! QPWS organised an infill planting at Massey Creek of around 1,000 trees and other community plantings took place on the Emms' property 'Cedarvale' (2,000 trees), McCaffrey's property 'Ringtail Crossing' (2,500 trees) and South Endeavour Trust's property 'Rock Road Corridor' where 10,000 trees were planted (7,500 by community volunteers and 2,500 by CVA (Conservation Volunteers Australia) volunteers). A season total of around 18,500 planted of which approximately 7,000 were raised at our nursery. All plantings were followed by the famous TREAT BBQ and I thank everyone turning up to plant or cook. In addition to community plantings over 6,300 trees went out to TREAT members for their own environmental projects and again this was down by about a third from recent years because of a lack of rain. All plantings have suffered at the hands of a particularly dry season unless there is irrigation which is not often possible due to location or cost. Our now usual workshops were undertaken towards the end of last year covering Plant Identification, Propagation Methods and Planting methods including site preparation and maintenance. Co-ordinated by Barbara Lanskey, they were well attended and will be repeated in the coming months. I thank Barbara, landholder Ian Freeman, presenters Mark McCaffrey, Ian Freeman, Peter Snodgrass and Alan Gillanders. Winter is the season for field days and this year we have visited Tony and Linda Milhinhos' property in Malanda and Eubenangee Swamp National Park. Still to come, the working field day at Palumbo's property and the much anticipated field day at Thiaki Creek Nature Refuge, both later this month. The importance of monitoring in previous plantings has been highlighted with the help of Simon Burchill and his work with the Green Army on Peterson Creek. TREAT has enjoyed the benefit of this federal government initiative, providing young willing workers to get stuck into these rather neglected plantings, with Simon's expert knowledge of the area and its problems. I thank Simon for this great volunteer effort and for his continued commitment to this as we anticipate another 12 months work with Green Army teams. TREAT has had a particularly good year securing future funding from both State and Federal governments through the Everyone's Environment Grants Round 3 and Terrain's Community Grants, mainly for ongoing plantings and maintenance on Peterson Creek but also for research into revegetation methods, showing our commitment to the future of environmental work on the Tablelands and continued innovation in this area. We look forward to the outcomes of these research projects. Lastly and most importantly I thank our fantastic committee, all of whom have contributed in various areas such as newsletter editor, website co-ordinator, data bases, grants, membership, education, tree allocations, secretary and treasurer. I thank them for their hard work, enthusiasm and especially for their commitment to another year in the team. Great team work from everyone and I look forward to the next year. Interesting that we say 'as blind as a bat' when most of the bats we see are flying foxes with large eyes and very good vision, night and day. In Europe they say 'as blind as a mole'. Some bats may have smaller eyes but echolocation provides them with a form of vision that is superior for their needs. So what is a bat? They have their own Order, Chiroptera, which means 'hand-wing' because the structure of the bat wing is the same as our hand. 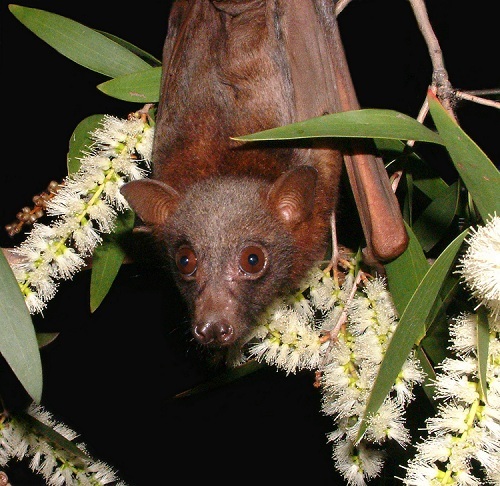 The easiest taxonomic division of this Order is into Microbat (uses echolocation and usually eats insects) and Megabat (doesn't use echolocation and usually eats fruit and nectar), but molecular genetics now talks about Yin-pterochiroptera and Yango-chiroptera. In this division the microbats with a nose-leaf (e.g. horseshoe bats) are lumped in with the megabats, and the rest of the microbats remain together. What is special about bats? There are 1331 species in the world, one quarter of all mammal species, living everywhere on this planet except Antarctica. We have 85 species in Australia. Diversity. Bats are incredibly diverse in appearance, diet, habitat, roosting sites, hunting styles etc. As a group they are known to eat insects, fish, blood, spiders, fruit, nectar, pollen, small mammals, reptiles and birds. Important ecological services - pollination, seed dispersal, insect control. Longevity - One 7gm microbat has been recorded living for 43 years. Density of some populations. This allows them to provide ecological services on a mass scale. Very low rates of cancer. Physiology. In flight bats often reach a heart rate of 1000 beats per minute (flying foxes have a resting heart rate of 360 beats per minute) and a body temperature of 42 degrees. Numbers 4-8 of these 'special attributes' have led to a multi-million dollar research project based in Singapore called 'Learning from Bats'. It's based on over 20 years of research with Black flying foxes at CSIRO in Geelong. This is a human health project that expects to improve our understanding of ageing, cancer, wound healing, control of viral infections and inflammation. Inflammation is responsible for many human diseases from arthritis to cardiovascular, autoimmune and neurological diseases. Why does it seem there has been a sudden emergence of viruses connected to bats? 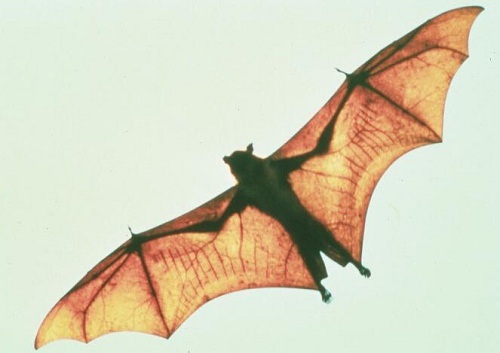 These viruses have co-evolved with bats and circulated for thousands or even millions of years within bat populations. Only recently, as humans increasingly disrupt ecosystems especially through land clearing, have these viruses reached a tipping point of spillover into new host species. Scientists are now asking what is so special about bats that they can live happily with these viruses. The concept of One Health believes the health of humans, animals and the environment are inextricably connected. Revegetation groups like TREAT are part of the solution to repairing the environment and so also human and animal health. Wildlife Friendly Fencing. Every September when the Tablelands bursts into blossom the Little Red flying foxes arrive at Tolga Scrub. They usually arrive in huge numbers, and it is mind-boggling to think of the amount of nectar that must be across the landscape to sustain them. We need to thank them for the enormous pollination service they provide but instead we place barbed wire in their way. Over the last month 175 Little Red flying foxes have come into care from entanglement on barbed wire, and who knows how many are still on fences away from the roads. A few years ago we got 108 off fences up Bones Knob in one day. About 80% of those caught are juveniles, young that have only been flying for a few months. Many are caught where food trees are planted along fence lines, or where fences are on ridgelines. Please monitor fences in your area and look at wildlifefriendlyfencing.com for friendly fencing ideas. Ring the Bat Hospital if you see a bat caught on a fence. Tick Paralysis. Every October to December thousands of Spectacled flying foxes come into contact with paralysis ticks. This is not a natural event; it is caused by their coming down low to feed on wild tobacco, a weed species from South America. They die unless treated with tick anti-toxin. The young are born at this same time of year and many of them die on their mothers unless rescued. Please keep your eyes open for them on the ground in your garden and ring the Bat Hospital. Electrocution. Female flying foxes may die on power lines but their young are insulated by the fur and remain alive. If you notice any on power lines check to see if there is a baby on board and if so ring the Bat Hospital. The babies can remain alive for several days. Visit the Bat Hospital. We have Advanced Ecotourism accreditation and are open to the public in the afternoons 3-6pm. Bookings are essential. Mabi (Tree-kangaroo) Forest is listed under the Commonwealth's Environment Protection and Biodiversity Conservation Act 1999 as a 'Critically Endangered Ecological Community'. Mabi Forest has two distinct zones, one on non-riparian (waterway) zones and the other on riparian zones. Both these zones have been allocated a definition through the State's Regional Ecosystem Status, being 7.8.3 for Mabi and 7.3.37 for Mabi on alluvium. I have called the Barron River riparian area from the Pink Bridge on the Malanda - Atherton Road, to where the Barron River enters Lake Tinaroo, as 'Mabi Flats'. Mabi on alluvium (Mabi Flats), through deposition processes, has a different soil make-up and also has a few different flora species to Mabi on higher ground. This article will focus on a section of Mabi Flats on the Bonadios' property. The Bonadios' property is on both sides of the Gillies Highway on the eastern side of the Barron River, bordered by McKeown Road and Pinnacle Pocket Road. On the northern side of the farm, their property adjoins the Picnic Crossing Scenic Reserve (Mabi Forest). When driving from Yungaburra to Atherton you may have noticed the new 'Green Corridor' sign with the young lad wearing the platypus-badged hat, just before the Jim Chapman Bridge. The Bonadio family purchased this property in 1967 which happened to be the biggest ever flood year, so they had insight into the power of the Barron River. 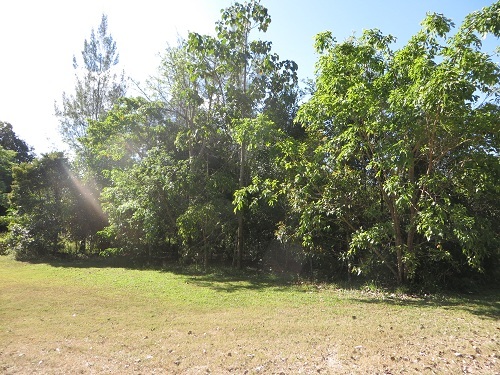 The property is approximately 300 acres and in 1967 had 18 paddocks equalling approximately 54 acres cleared. They grew corn, potatoes and other market garden produce. They originally pumped from the Barron to water their cash crops but now rarely water crops and if they do, bores are used. Progressively the property was cleared and today 200 acres are under corn annually. Corn is an ideal dryland summer crop on the Tablelands where farmers utilise the wet season rather than irrigation. The latter can be very marginal because of electricity costs (pumping from a bore). Corn in a good year will return $900 per acre before costs are taken out, but if browsing occurs from vermin (rats) around the peripheries of cropped areas, corn becomes marginal. Unmanaged lands adjoining corn paddocks harbour rats which live in the Guinea grass and eat the corn during the night. Ron Bonadio stated "where there are weeds on the edge of the corn, the rats will eat the first dozen rows of corn; I reckon we lose about 40 tonnes of corn a year.. where we mow or have weed-free rainforest, they only eat the first 2 rows". Ron also mentioned "we started the revegetation on our place for two reasons: one was because the area we decided to revegetate was getting eaten by rats and wasn't worth growing corn, and it would enhance our tourism activities". The Bonadios first started their tourism venture in 1994, right in the middle of the Japanese tourist boom. The Barron River is well known for its platypus and a Cairns Japanese tour operator approached the Bonadios to try tourism. Eventually they decided to give it a go. They still have a Japanese tour visiting the site each evening and the average number of daily visitors of 20 has been steady since 1994. Over the years their agri-tourism venture has expanded into providing both a farm fresh meal (the visitors want the barbecue experience with steak, crocodile and kangaroo) and arboreal viewing for visitors. The whole family have roles delivering the tourism experience, with Nona, Alarina and Vanna being the backbone. Vanna said "we have created ourselves a job". Also a small RV park has started. There grey nomads have a great spot nestled between corn paddocks and Mabi forest. Alan Bonadio with his building background has overseen the building of rustic tourist infrastructure where 2 visitor nodes have been developed. Through their on-farm diversification, the Bonadios realised that returning their lower corn-growing areas back to forest would, over time enhance the tourism experience. They also thought, given the predation from rats in these lower areas, that if they could make a couple of dollars from tourism, it was worth it. The Bonadios decided to take approximately 20 acres of Mabi Flats out of production and turn it back to forest. 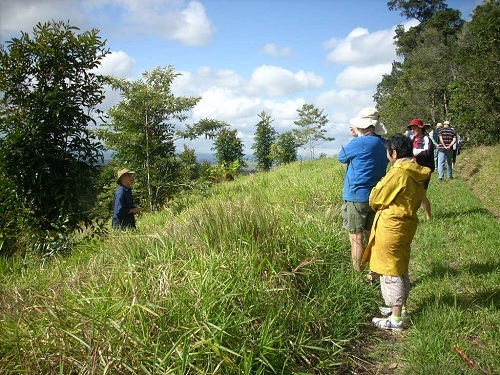 At the same time Barron Catchment Care (BCC) in 2006 were starting their iconic Green Corridor Project for which they received corporate funding (from Cairns Airport) to potentially rehabilitate 20 hectares a year in the Barron catchment. 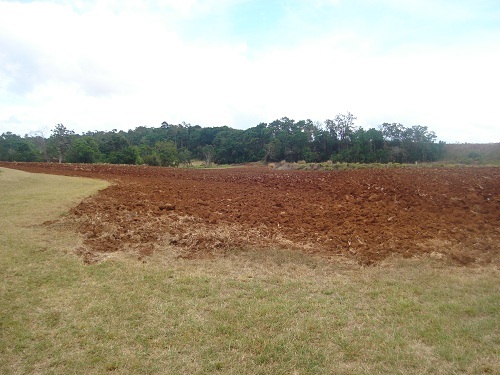 BCC approached the Bonadios to see if they were interested in revegetation on their property on a large scale. Cautious at first, they allowed the planting of a 1 hectare patch in 2006. This was a planting day run as Tropical Tree Day through a partnership between BCC and TREAT and was a fantastic success with 100 plus volunteers turning up. The Bonadios and BCC have continued undertaking rehabilitation on the property ever since. To date they have planted approximately 8 hectares of 'Greenfield' revegetation and enhanced approximately 5 hectares of Mabi remnant. Their commitment to revegetate and re-install Mabi Forest on the property has had various flow-on effects. Other landholders on the Tablelands have noticed the difference and have approached BCC to undertake rehabilitation on their properties. Scientists are undertaking various studies on the property such as comparing soil carbon sequestration between revegetation and corn paddocks. School groups from primary to secondary conduct field trips to the Bonadios' property as part of their study, including camping overnight utilising the tourism infrastructure. Employment programs such as Green Corps, work on the revegetation as part of their training program; currently BCC are utilising Green Army to assist with works. The annual loss of corn production (approximately $15,000) is overcome by the cash flow generated by agri-tourism. Ron Bonadio suggests all agricultural areas should have a minimum of 50 metres of native vegetation (both sides) along creek and river banks. dignitaries such as the Threatened Species Commissioner, Virgin Airline representatives, actress Daryl Hannah and politicians all visit the site as part of their programs in North Queensland. BCC in partnership with TREAT will be holding a field day in February 2016 where 300 advanced (1.5 m) seedlings will be planted as infill and members of the Mabi Working Group (a group established in 2012) will be onsite. Landholders are encouraged to attend to meet the Bonadios and check out the revegetation area and tourism facilities. Your TREAT membership starts at the month in which you joined TREAT and costs $15 per year. It covers the household at the address given. Our newsletters are produced quarterly and when your membership is due or nearly due after a year, we put a red dot on your newsletter address label and enclose a renewal form with an envelope so you can post your renewal back to TREAT. There is an option of paying membership by direct deposit and more members are taking advantage of this. If using this option, you must give your name so we can match the deposit to the household renewing membership. Membership can be paid for several years in advance and a red dot is then given when the years have expired. Members are given another red dot reminder if they are still overdue when the next newsletter is posted. Often people can be on extended holidays or maybe an intention to renew is simply overlooked. However, if membership is in arrears for too long, we stop posting the newsletters and the household is removed from our membership database. Sometimes I send a letter to encourage people to continue their membership when it has lapsed for several months. Because I organise the production and posting of newsletters, various names become familiar and I have a sense of how long people have been members. Many members cannot plant trees or take part in our activities but still support us through their membership and this is appreciated. Members are entitled to 10 free trees a year. New members are entitled to their trees at the end of their first year. Those members who have a tree planting project on their property can apply for up to 300 free trees a year. Their project needs to be approved by TREAT's management committee. Members new to tree planting are required to attend TREAT's revegetation workshop before trees for any project are approved. TREAT is a voluntary tree planting organisation and relies on volunteer input to achieve its aims of revegetation and education. However, it also needs funds to pay contractors who carry out site preparation and maintenance of TREAT plantings, and for the purchase of fertilisers, irrigation equipment, frost guards etc. As TREAT works in partnership with QPWS at the Lake Eacham nursery, trees for our projects are free. Recently our grants officers, Angela, Alison and Michael were successful in obtaining funding from both the State Government through their Everyone's Environment Grant (EEG) Round 3, and from the Federal Government via Terrain NRM, the local natural resource management group, through Terrain's 2015 Community Grants program. The EEG grant of $23,500 will pay for maintenance (till April 2017) of this year's TREAT plantings at the Peeramon bridge area of Peterson Creek, plus site preparation for TREAT's next Peterson Creek planting on Ian Freeman's property in 2016. TREAT secured two lots of funding from Terrain: one for on-ground works at Peterson Creek and the other for two research projects. The on-ground works grant of $29,700 will cover costs associated with a new planting (in 2016) at the Peeramon bridge area of Peterson Creek, this time on De Tournouer's property. It will also cover maintenance costs (including fertiliser applications) for this planting and the next Freeman's planting, till May 2018. Maintenance of previous plantings, after the EEG grant finishes in April 2017, will also be from this grant. A grant of $31,560 (till May 2018) was obtained to continue the Kickstart Trials at Cloudland NR (Nature Refuge) and Ringtail Crossing NR. These trials are conducted by Professor Carla Catterall of Griffith University assisted by Kylie Freebody. Beginning in January 2016, the grant covers costs for 3 condition assessments each year, weed control as determined by the evaluation processes following condition assessments, annual vegetation structure monitoring on 2 control plots (grazed and ungrazed) and scientific reviews of all data collected. As well, there will be a community field day and a TREAT newsletter article, followed by preparation for the publication of results when suitable. A further grant of $7,650 was obtained for research into improving rainforest replanting practices in the Wet Tropics, to be conducted by Cath Moran. This grant runs for a year from November 2015. A workshop will be held in May 2016 to draw out information from revegetation practitioners and restoration consultants about various methods used and associated costs. Knowledge gaps in the science will be identified and a report written. This report will identify key elements of variation in replanting methods, analysis of existing data, costs associated with different methods, knowledge gaps and specific questions for future research, together with potential research sites. Our grants team are to be congratulated on their success - a lot of guidelines (which keep changing) need to be negotiated when applying for any grant. TREAT has also benefitted from Terrain's successful sponsorship of a Green Army team to work within the Mabi Forest area - Mabi forest being a threatened ecosystem. Peterson Creek is largely within Mabi forest boundaries and thanks to Simon Burchill volunteering his time and expertise, the first young Green Army recruits have helped remove a lot of weeds from older TREAT plantings along Peterson Creek. In September at a weed symposium at Longreach, Tablelands National Park Volunteers (TNPV) were presented with a prestigious biennial award by the Weed Society of Queensland, the 'George N. Batianoff Award for Team Excellence in Weed Management'. Simon Burchill accepted the award on behalf of TNPV. John Clarkson, a friend and colleague of the late George Batianoff, presented the award and spoke about the work done by TNPV. George Batianoff joined the staff of the Queensland Herbarium in 1974, after working for a while with the Department of Primary Industries. Among his many interests were the rehabilitation of mined areas in Central Queensland, the ecology of coral cays and the unique flora of serpentinite regions worldwide. His other quest was to document the impact of invasive plants on the environment and to develop appropriate weed management. It is for that work that he is honoured and remembered by the award. TNPV is an incorporated association that has been operating in partnership with Queensland Parks and Wildlife Service and the Queensland Department of Environment and Heritage Protection on the Atherton Tablelands since 1993. The group contributes between 1,500 and 2,000 volunteer hours per year assisting with pest management, environmental education and threatened species research. This small group, led by current president Alan Gillanders, consistently delivers outstanding on-ground outcomes in weed management. Their achievements are exemplified by their sustained efforts to eradicate coffee from the Crater Lakes National Park. Coffee is classed as an environmental weed by the Wet Tropics Management Authority. It has invaded certain closed forest communities, in particular the critically endangered Mabi Forests of the Atherton Tableland. These forests are home to 13 plant and 12 animal species that are listed as threatened nationally or in Queensland. TNPV began a control program in the Lake Eacham and Lake Barrine sections of the National Park in 2005. Control efforts, aimed at eradication of the species from both sites, have been sustained since then. In 2014 alone, volunteers contributed 377 hours to the program. A short article summarising the program appeared in the Summer/Autumn edition of WeedShine in 2013. The group is some time away from being in a position to claim eradication. Re-infestation from private gardens nearby poses an ongoing threat. To counter this, the group has undertaken a public awareness campaign aimed at encouraging landholders living close to the National Park to consider removing coffee from their gardens. The efforts of the Volunteers, however, are not restricted to this project alone. The Team is involved in many projects including lantana control works at 40-Mile Scrub National Park, removal of weedy vines from the Halloran's Hill Regional Park and Turbina and Madeira Vine eradication programs at the Curtain Fig National Park. They also regularly attend public events providing information on environmental issues and run the highly popular Lake Eacham Nature Kids Club, an environmental program for 6 to 12 year old school children. TNPV has more than adequately demonstrated the extraordinary level of commitment and on-ground results expected of recipients of the George N. Batianoff Award. TREAT held two field days in September, one a working field day at Peterson Creek and the other a look at revegetation experiments at Upper Barron. This day was to plant some Creek Cherry and Lomandra along the edge of Peterson Creek as infill on Bill and Laura Palumbo's property. It formed part of 'Bushcare's Major Day Out' across the country. Only a core group of 14 TREAT regulars turned up but numbers were swelled by 23 School for Field Studies students and staff. This group of students had arrived in Australia only a week earlier and were keen to learn and take part in planting. We were glad of their enthusiasm and presence as the silt proved harder to dig into than anticipated - most of us just had trowels for digging. At one spot a damp erosion gully from the nearby paddock gave some relief with much softer silt. All the plants were mulched with leaf litter and watered. As we worked downstream, some students ended up planting at a small peninsula area. I remembered it as part of a field day held many years ago, so could show the students the outstanding growth of several Trema orientalis trees. They grew so quickly and dropped so much leaf litter that the area formed a canopy and was weed-free in record time. TREAT set up a gazebo in the shade of a large Macadamia tree near Palumbo's shed, and afternoon tea was welcome after planting. The weather was fine and neither too hot nor cold. The students arrived with a very large chocolate cake they'd made and that quickly disappeared. It was a productive and enjoyable afternoon. Many revegetation practitioners looked forward to this field day. Noel Preece and Penny van Oosterzee are conducting a research project at their property and planted a large number of trees in 2011 just before Cyclone Yasi. TREAT readers have been kept up to date with articles in the newsletters of July-Sept 2009, Jul-Sept 2011 and Oct-Dec 2013. Thirty people attended the field day. Before a walk around the experimental plots, Penny and Noel gave us a lot of background information via a screen presentation. Many questions were asked and information flowed back and forth. Much has been learnt but much remains for researchers to answer. We walked along the ridge of the Yasi planting then wound down into the valley and returned to the house for afternoon tea. We straggled along stopping here and there and discussed various aspects of revegetation with each other, sharing our experiences. It was a most informative afternoon. Rangers and TREAT volunteers celebrated International Rangers Day this year with a morning tea at the nursery on July 31. The day is in honour of rangers worldwide who have been killed or injured in the line of duty, and also to celebrate the work that rangers do to protect the world's natural and cultural treasures. Proceeds from the morning tea were donated to the Thin Green Line Foundation, who provide essential equipment and training to rangers as well as financial support to widows and orphans of park rangers killed or injured. More information can be found at: www.internationalrangers.org/ and Thin Green Line . Peter and Simon have kept on top of the weeds at this year's Massey Creek planting and report that the site is doing well with very few losses. This will enable us to look at planting on some new ground adjacent to the current site - which was originally planted in 2012 and has required infill plantings in subsequent years. With Darren's return from working with the QPWS Lake Eacham Management Unit since January this year, we bade farewell to Simon from the nursery in September. Simon is currently working with the Lake Eacham Management Unit. The following tables are a summary of the nursery annual production figures provided to TREAT at their 2015 Annual General Meeting and include 3 year comparison figures.